Explore the Bethany Beach real estate listings below! Bethany Beach real estate offers the same breathtaking coastal views of the Atlantic without the throngs of tourists that flock to the larger communities of Ocean City and Rehoboth Beach. One of Sussex County's Quiet Beaches, Bethany Beach is a dream come true for retirees on the search for the most luxurious of beach communities. Affordable single family residences make ideal homes for those who enjoy an active beach lifestyle on the beautiful expanses of the small town East Coast. Browse all of the current listing below, or keep reading to find out more about the charming architecture of Bethany Beach homes for sale. Create custom searches, bookmark your favorite listings and get email alerts when homes in Bethany Beach matching your dream criteria hit the market. Bethany Beach homes for sale range from sky high ventures to reanoably priced abodes. Million dollar beach front estates feature crown moldings, expansive decks, and sunny solariums. Affordable single family residences can have a cabin on the beach feel or a modern suburban style. Trendy townhomes and condos can be the perfect residence for a single professional or a part-time vacation home for a retired couple. With Bethany Beach covering an area of only a single square mile, one thing is for sure, you'll never be more than a few minutes away from the beach whether you choose to drive or walk. Bethany was founded as a "Haven of Rest for Quiet People" in 1901 by members of the Disciples of Christ church from neighboring Pennsylvania and Washington DC. Bethany was intended to be a permanent summer camp for the nationwide church. However, that dream had difficulty being realized, and the church's property was sold to a team of businessmen from Pennsylvania. They soon began work on a canal to facilitate easier travel to Bethany, as well as the construction of several inns and homes, many of which are still standing. 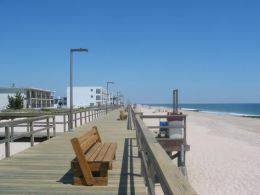 Bethany is known as one of Sussex County's "Quiet Beaches," due to its low key atmosphere, and family friendly feel. The beaches in Bethany are often less crowded, and certainly less ruckus than neighboring Ocean City, Dewey and Rehoboth Beaches. Families particularly appreciate the rental umbrellas and lifeguarded beaches. Bethany has a quaint shopping district along Garfield Parkway, featuring many unique shops and restaurants. The Bethany Beach Bandstand offers free music concerts throughout the summer months. The community also hosts a large Fourth of July parade and fireworks each year. Downtown Bethany Beach offers all of the basic amenities, and more than a few fine places to dine. Bluecoast Seafood Grille offers an extensive selection of fine wines to pair with the catch of the day, and DiFebo's is the ultimate in Italian cuisine. Garfield Parkway hosts Bethany Beach's quaint shopping district comprised of many unique shops. An additional perk, shopping is tax free. Should you choose to venture to one of neighboring communities, Highway 1 is paralleled by water on both sides, lending to a stunning half hour drive to Ocean City. For those who love the beach, the possibilities are nearly endless. Stroll the soft sand beaches and watch the families with young children play in the surf or build sand castles. Catch a glimpse of the more adventurous parasailing or paddle boarding. Enjoy a relaxing ride in a kayak or take out the boat for an afternoon of fishing. Music enthusiasts and families with young children can delight in the fact that throughout the summer months, the Bethany Beach Bandstand offers free concerts. Additional family fun can be found on the Fourth of July when the community organizes its annual parade and fireworks. Make this vacation destination more than your home away from home. Contact Mann & Sons about Bethany Beach real estate today.